On the same night that Samoa claimed an historic first ever IRB Sevens World Series title, their prolific try-scorer Mikaele Pesamino was named IRB Sevens Player of the Year. The leading try-scorer in this year's Series with 56, Pesamino fought off stiff competition from countrymen Lolo Lui and Alafoti Fa'osiliva and England's Ben Gollings to win the coveted individual Award. "I wanted to be the top try scorer this year and I wanted to be the Player of the Year and I feel great, I feel happy, not only for me but also for my team mates, my family all the way from Samoa. They pray for us, they cheer for us, and also our fans, our younger players, this is our best gift for them for our Independence Day next week," said Pesamino on receiving the award. "It's Sunday today in Samoa and the people will go to church and the pastors will talk and I think they will talk about rugby on this day. Our Prime Minister said that we would have a national holiday if we won the Series, and we'll celebrate, we'll enjoy tonight and this is our best gift to our people." Pesamino proved a remarkable match-winner for Samoa, helping them to event wins in Las Vegas, Adelaide, Hong Kong and Edinburgh with 56 tries, 23 more than anyone else this season. 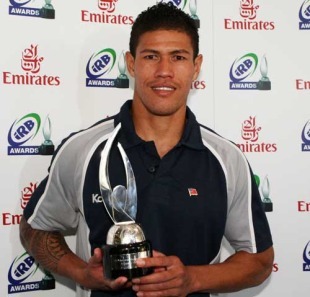 Mikaele Pesamino is the second Samoan to win the IRB Sevens Player of the Year Award, following team mate Uale Mai who scooped the prize in 2006.